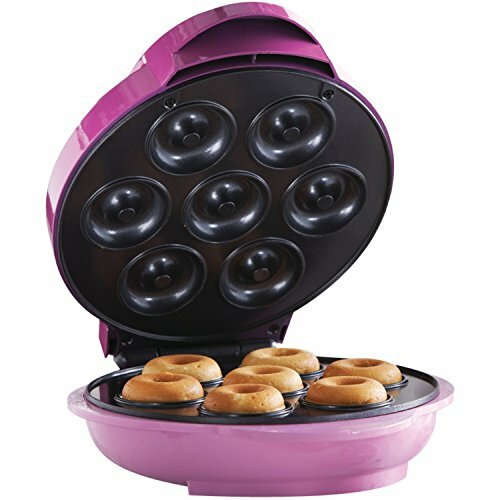 Use the powerful 750 watt Brentwood TS-250 Non-Stick Mini Donut Maker Machine to bake 7 perfect mini donuts in just a few minutes. Impress your kids, friends and family with delicious varieties of mini donuts, brownies, cakes, muffins and more. Easily slide your mini donuts right off the easy to clean non-stick plates. Power and pre heat indicator lights inform you when the plates are hot and ready. Vertical feet and cable wrap allow the unit to stand upright for incredibly small storage. For safety, the mini donut maker will automatically shut off if it senses overheating.